What a sad, sad, story. Even while I was listening, I was hoping for a different ending. Jeff Guinn is an excellent author of true crime. He is somehow able to relate the facts of the story without passing judgement. In this case, I learned a lot. The Peoples Church, (no apostrophe! ), did a lot of work in the area of desegregation. Jim Jones and his wife even adopted a black child. In fact, they did a lot of good works together, for the elderly and for the members of their church. But as so often happens, absolute power corrupts and all that. Jim ran his church with an iron fist. He slept with many partners and somehow made it so that it was okay within his church. He began to do drugs-a lot of drugs. There was corporal punishment for those who did not follow the rules. He began to become paranoid and unbearable to be around, at times. Follow this to the end that we all knew was coming. I didn't realize how many people were involved in this mass suicide/mass murder, but I know now it was over 900. I say mass murder because children, (children! ), were killed by having a syringe full of poisoned flavor-aide shot down their throats. It's one thing when your twisted beliefs cause you to kill yourself, it's another thing entirely to kill infants and children. It's just such a waste of life. Despite my attempts, I will never understand this mentality. I'm fascinated with it, I admit, but I can't understand it. Perhaps, it's just not understandable? It's certainly not sane. 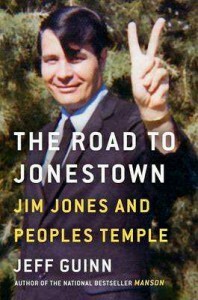 If you want to learn more about the Peoples Church and Jim Jones, then I highly recommend this book. I listened to it on audio, narrated by George Newbern and he was excellent.